Who invented the personal essay? That is hard to say. The ancient Roman philosopher and cynical power broker, Seneca? The 16th century French philosopher Montaigne certainly brought it to a peak of perfection. There were many 19th century masters, not so many after that. 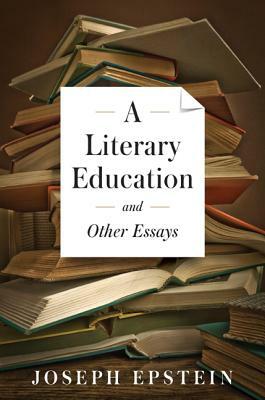 Who is the greatest living essayist writing in English? That requires no debate at all. It is unquestionably Joseph Epstein. He is not only the best living essayist; he is right up there in the company of Seneca and Montaigne, but one of our own, living in our era and dealing with our pleasures and travails. Epstein is penetrating. He is witty. He has a magic touch with words, that hard to define but immediately recognizable quality called style. Above all, he is impossible to put down. Epstein reads omnivorously and brings us the best of what he reads, passages that we would never have found on our own. How easy it is today, in the digital age, drowning in emails and other ephemera, to forget the simple delight of reading for no intended purpose. Like any master essayist, however, this one brings us more than the shared experience of a lifetime of reading. He brings us himself, alternately scolding and charming, sparkling and deep, buoyant and sad, zany and wise, rebellious and conservative, bookworm and sports fan, clever and everyman, debunker and preservationist, deep into high culture, deep into low culture, curious, fresh, and settled in his ways. This is the friend we all wish we could have, the ideal, humane companion who is completely comfortable in his own human skin. Like Plutarch, he gives us life teaching by example, but with a wry smile and such a sure hand that we hardly notice the instruction. It is pure pleasure. Joseph Epstein was editor of the American Scholar. A long time resident of Chicago, he has taught English and writing at Northwestern for many years. He is the author of 23 books, many of them collections of essays, and has also written for numerous magazines including The New Yorker, the Atlantic, and Commentary.